TOKYO (AP) -- New IOC President Thomas Bach says there is a possibility that baseball and softball could be included in the program for the 2020 Olympics in Tokyo. "This is will be under discussion," Bach said at a press conference on Wednesday. "We will have the first broad discussion in December in a meeting of the Executive Board of the IOC, then the Executive Board will present its first discussion paper to the IOC session in Sochi." Baseball and softball were dropped from the 2012 program after a 2005 vote by the IOC. They failed in a bid to be reinstated for the Olympic program for 2020 and 2024 at an IOC vote in September, but Tokyo's winning bid has refueled calls for them to be included when the Japanese capital hosts the games. While the Olympic Charter states that a sport's inclusion in the program must be decided not later than the session electing the host city, Bach stressed the need to be flexible. 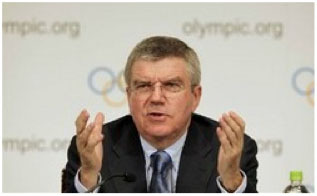 "I am open for more flexibility in the Olympic program," Bach said. "But first we have to see what the rest of my colleagues in the IOC think." Baseball and softball are very popular in Japan and there are many existing facilities in the Tokyo area that could be used if the sports were included. Bach was accompanied by IOC vice president John Coates, who heads the coordination commission for the Tokyo Games. Japan is scaling down the cost of the planned 80,000-seat main stadium following an uproar from some prominent architects who think it's too big and expensive. Coates said the IOC is open to changes as long as the cutbacks don't compromise the basic plan of the facility. "It's inevitable that costs will be reduced," Coates said. "We are always open to that as long as the basic facility isn't compromised."